Stewardship outcomes in the Southern Drakensberg. Anybody that has worked in the Drakensberg, knows that the mountains are as treacherous as they are beautiful. The high altitude, coupled with rapidly changing weather conditions, is a recipe for a challenging journey. The metaphor of the mountain is not unlike our experience of trying to declare protected areas in the Southern Drakensberg over the past four years. Some days were beautiful with a sense of great achievement, while other days were reminiscent of sitting on open rock-face in the cold and rain. Despite massive efforts to push forward, it felt like hardly an inch of progress was made on these days. Then eventually, the top of the mountain is reached, and looking down you can see the route you have chosen and how it has culminated in bringing you to this point. And so it has been with our work, funded by the Critical Ecosystem Partnership Fund. Our project started in 2012 with the aim of introducing the Biodiversity Stewardship Programme (BSP) to landowners in the district. The BSP allows landowners to enter into a voluntary partnership with conservation agencies in which they are able to bestow conservation status and long term protection over their land that is legally recognized. Initially we focused our work and interactions with farmers in four prime crane areas in the Southern Drakensberg: namely, the Underberg area, the Kokstad area, the Cedarville area, and the Swartberg area. Landowners in each of these areas signed up for the process of becoming a stewardship site. Some were eager and willing, while others proceeded with caution. Many landowners were not interested in the pursuing the programme at all, but continued to work very closely with us on cranes and other biodiversity matters. Our target of 5500 ha of suitable crane habitat to be declared under the BSP did not seem like much, but at times, various setbacks made this number seem quite elusive. In 2013 two farmers that were part of the programme suddenly and unexpectedly passed away – causing a withdrawal of almost 4000 ha of land that was committed to the BSP. As time progressed, the relationships strengthened, but the process became more formal requiring landowners to commit to legal contracts and management plans, so understandably even more landowners decided to pull out of the programme. Many landowners, however, chose to stay involved and were able to see the advantage of continuing with the process and are proud to leave a legacy of long term protection of some of South Africa’s most beautiful landscapes and biodiversity. As our project funding comes to an end, we have managed to declare through the BSP process, the Beaumont Nature Reserve in Swartberg (1050 ha) and the Cedarville Protected Environment (17 500 ha) in Cedarville. Another four sites in KZN will be declared shortly contributing further to crane and wetland conservation in the Southern Drakensberg. They will assist the provinces in meeting conservation targets for a number of poorly protected habitat types and they will demonstrate the important role that agricultural landscapes, if managed correctly, can play in conservation. Of course our involvement with these sites has only just begun. What is now required us is to demonstrate to landowners that their decision to join the Biodiversity Stewardship Programme will be beneficial. While much has been achieved, we realize that the journey down the mountain will also have some stumbling blocks. With careful navigation and determination, we will however arrive at our destination – a future where cranes, wetlands and people thrive together and not at the expense of one or another. The key in conservation is to keep on walking forward, even when the going gets tough. 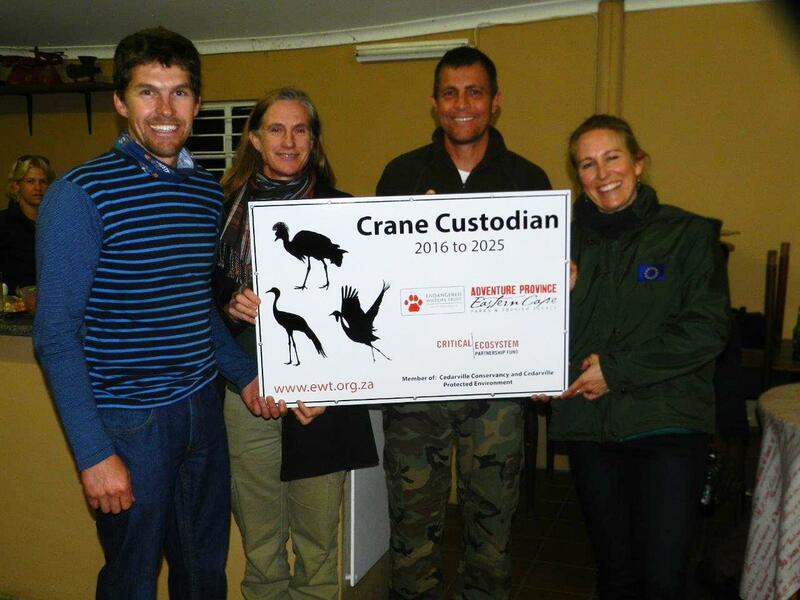 This entry was posted in African Crane Conservation Programme. Bookmark the permalink.